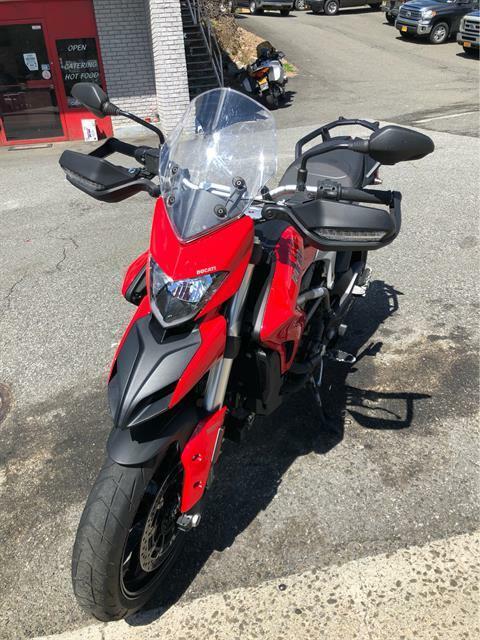 TOURING ERGONOMICS: With a wide and comfortable Touring seat set at a height of just 810mm and a handlebar 20 mm higher than that of the standard, the Hyperstrada 939 further improves the rider's comfort and position so long distances can be covered, even with a passenger, in complete comfort. NEW TESTASTRETTA 11°: The new Hypermotard 939 family utilizes a 4-valve engine with a water-cooled cylinder, featuring a bore x stroke of 94 mm x 67.5 mm designed to achieve a perfect balance between usability and performance: this is the new 937 cc Testastretta 11° engine which provides maximum power of 113 hp @ 9,000 rpm and torque of 97.9 Nm @ 7,500 rpm. This new engine uses technical solutions which directly reflect Ducati's engineering know-how and have led to the creation of an extremely fluid and stable engine: the 11° valve overlap confirms the excellent results obtained in the Multistrada 1200 family and optimizes the exhaust and intake stages with consequent steady operation at medium and low speeds. Targeted fuel injectors aim the jet of fuel directly at the hotter rear end of the intake valve so that all fuel is atomized; a secondary air system similar to that of the 1299 Panigale enables the engine's operation to be optimized thanks to the controlled flow of oxygen which reduces cyclical combustion dispersion, thus effectively eliminating unburnt fuel. 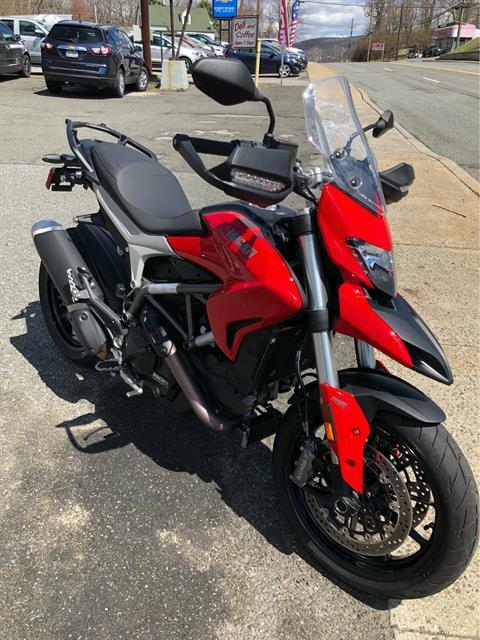 Ultimately, Ducati has managed to obtain a new engine that is extremely enjoyable, performs excellently and which can significantly limit emissions of unburnt fuel. 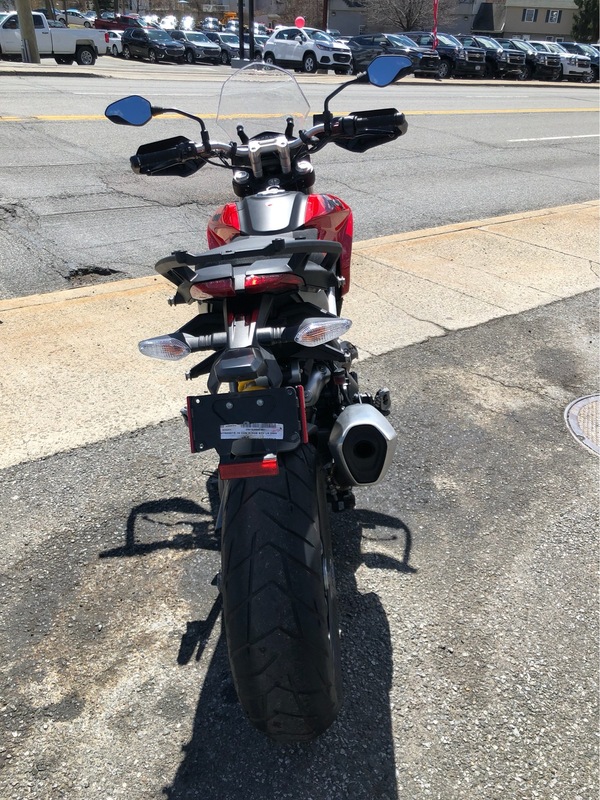 POWER MODES: The Ride-by-Wire system, which is present on all the models in the Hypermotard 939 family, allows 3 different engine mappings to be used to control torque and power: 113 hp with sporting "HIGH" delivery, 113 hp with progressive "MEDIUM" delivery, 75 hp with progressive "LOW" delivery. The structural features of the new 937 cc Testastretta 11° engine, together with the use of the Ride-by-Wire system which controls the opening of the throttle body butterflies on the basis of the input received, are the starting point in obtaining the Modes de Conduite for the new Hypermotard 939 models. Each Riding Mode has a preset engine mapping, which can be adjusted and customized to suit rider needs. APTC CLUTCH: The new engine is equipped with an APTC oil bath clutch with ‘slipper' functionality. Its design uses a progressive self-servo system and plates with a high wear co-efficient, increasing the torque available with all other factors being constant, and reducing clutch spring loading and lever effort. It is cable actuated, which has proven to be the best solution for the application in terms of build simplicity. The slipper function intervenes when the drive force is reversed, and reduces the pressure on the clutch discs to prevent wheel hop and maintain the vehicle's stability during aggressive downshifts. 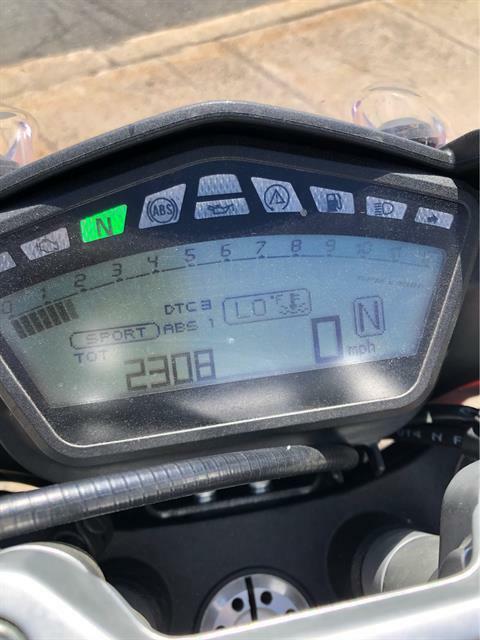 SERVICE INTERVAL OF 30,000 KM: Thanks to the constant investment by Ducati in quality and reliability, the new 937 cc Testastretta 11° engine keeps excellent maintenance intervals: valve adjustment is now scheduled for every 30.000 km which is a great advantage for Ducati customers. PIRELLI SCORPION TRAIL: The Hyperstrada 939's ability to tackle long distances is also shown in the choice of its tyres. 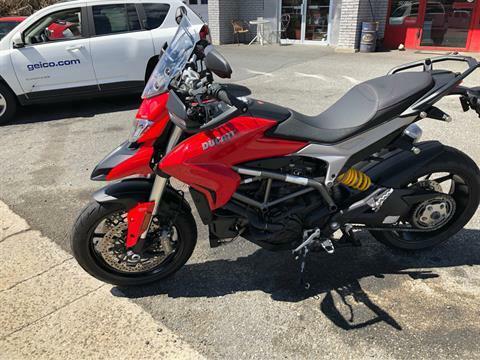 As the "tourer" of the Hypermotard 939 family, the Hyperstrada 939 has Pirelli Scorpion Trail tyres as standard which guarantee excellent traction in all weather conditions and superb fuel efficiency. The front wheel takes a 120/70 x 17" tyre, while the rear has a 180/55 x 17" tyre. TOURING EQUIPMENT: Designed for travel outside urban centres, Ducati has equipped the Hyperstrada 939 with robust, semi-rigid side bags, but which are at the same time light and stylish. The bags have a capacity of 50 litres and can be easily removed, making them particularly convenient and practical. The presence of a centre stand, on the other hand, increases the stability of the motorbike under full load. Special consideration has been given to riders who wish to share their travel experience with a passenger and a special wide seat is fitted, with thick foam support to increase comfort on long journeys. To this are added passenger grab handles that enable a wider and safer grip for excellent stability. 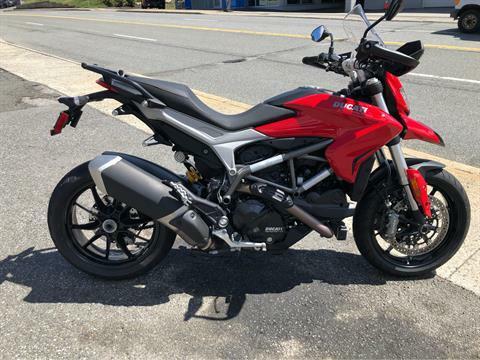 POWER OUTLETS: The Hyperstrada 939 has two 12 V power outlets, one on each side just below the rider's seat. They supply loads up to a total of 8 A (fused capacity), including heated riding gear, intercom, mobile battery charger and navigating instruments. Rear - 10-spoke in light alloy, 5.5 x 17 in.